Organizing family friendly races since 2012. TBE would like to welcome the inflatable arch finish/start line to our equipment line. It will be used at our future races and is available to rent by other races. 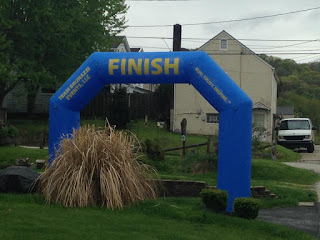 Team Brunazzi, Team Brunazzi Events LLC, the Boston Harvest 5k/10k/Half Marathon, the P&LE Express 4 mile/10 mile, the Not Another Polar Vortex 5k/15k, the RSD Awareness 6k and Yough Trail Runner, are the property and ideas of Team Brunazzi Events LLC. Pictures and images are the property of Shane Brunazzi OR are used with permission. Do not copy, take, or use without permission. Copyright 2010-2017 All Rights Reserved. Picture Window theme. Powered by Blogger.